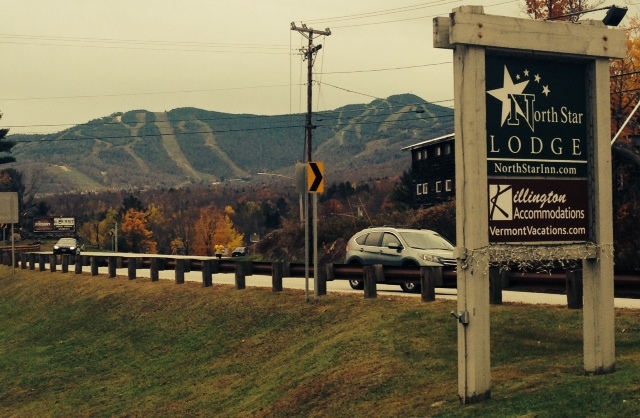 Driving just two miles from our top floor room at the North Star Lodge in Killington, VT, we park across the street from the iconic Inn at Long Trail on Route 4. Established in 1761, Killington was a rural town of farmers, raising crops and tending sheep. Now it is known as a hot spot for ski bums and bunnies. 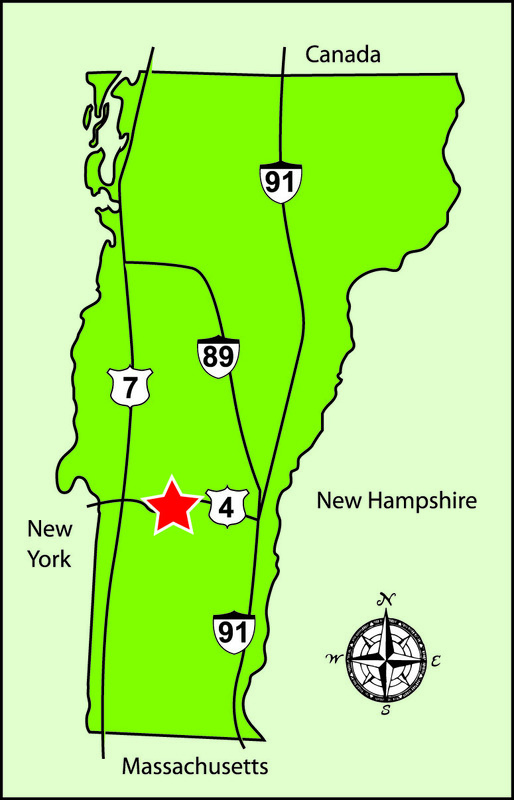 Killington’s voters have twice voted to secede from Vermont and join the state of New Hampshire; Killington is in fact 25 miles west of the NH border. The movement comes from a frustration with the amount of taxes Killington sends to the state of Vermont. The votes are largely symbolic since secession would require the approval of both states’ legislatures. 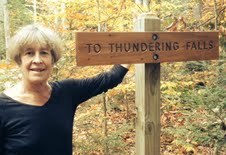 Today we hike east on the Appalachian Trail towards Thundering Falls. Before we head out, we check in at the Inn lobby. The accommodating morning clerk gives us a map of both the Long Trail and Appalachian Trail. Today it will be the AT, tomorrow the LT. Starting a the east end of the Inn at Long Trail parking lot, we take to the blue blaze trail (8 inch splashes of blue paint on trees and rocks indicating a side trail) which will lead us to the main trail with its white blazes; immediately we are climbing, breathing heavier, and skirting the side of Deer Leap Mountain to our left. The climb is rocky and parallel to Route 4 for one half mile. The golden and brown leaves cover the trail; that said, the blue, and later the white blazes of the AT, keep us confident that we are on the right trail. 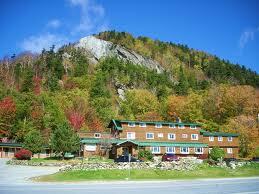 Our mid-October morning is 50 degrees and we are protected from the mountain side winds by the thick forest. The climb is steep, our attention focused on the climb so our plan to discuss some of our couple’s retreat questions will have to wait. This is my 8th of 14 states which the AT crosses. Previously, I’ve hiked the AT (going from south to north) in Virginia, West Virginia, Maryland, New York, Massachusetts, New Hampshire, and Maine. 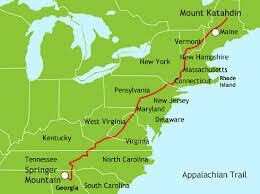 By the way, Hannah has run on the AT in North Carolina, making her total nine. Quickly the trail descends some 800 feet over the next 20 minutes. As counterintuitive as it may be, it’s more challenging to hike down a mountain than up. True we burn more calories climbing up, but we must step carefully to maintain our balance as we inch down. My heavy Timberland hiking boots with three pairs of mixed blend wool socks give me a firm foundation in descent. Shortly we are rolling into Gifford Woods State Park. 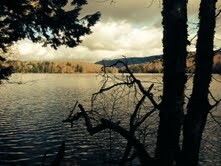 Across from Gifford Woods, the AT is a delightful meandering level trail that allows us to resume conversation and make it a walk in the park along Kent Pond. We resume our “couple’s retreat” discussion of our marriage. What should we do more together? and What do you enjoy most about me as a spouse? With few leaves on the trees, peak foliage has passed. Last night’s rain has brought down even more leaves. It is ideal hiking weather with not an insect to be found and still no bear to be observed. We don’t expect to see any thru-hikers today since northbound hikers on the AT are still 485 miles from Katahdin. By this mid-October day, Mount Katahdin has closed for AT hikers because of wintery weather. After an easy hour and three quarters of hiking, maybe 3.5 miles, we come upon a short blue blaze trail to Thundering Falls. 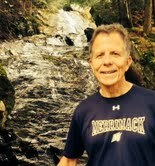 These falls cascade some 60 feet as we watch from an observation deck elevated two stories above the Thundering Brook. 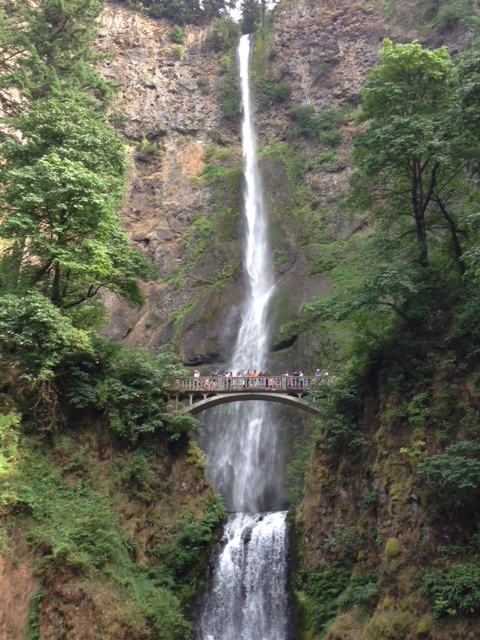 Check out this 41 second video shot at Thundering Falls. It’s a perfect day for hiking with Hannah now in the sunny mid-50s but entirely under the forest canopy. Heading for home on the level forest trail, I bring up more marriage questions to give verbal substance to our hike. How do we do spending and giving away our money? How can we deepen our physical relationship? And then we come upon the Mother Lode: Fullspeed (trail name because he always leads their two-person hike) and Notso (always following behind), section hikers on the Appalachian Trail. 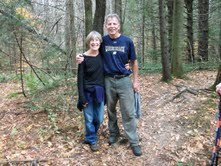 Since 1984 they have hiked parts of the Appalachian Trail in one and two week “sections,” generally in the fall and winter when the trail is less crowded and the bugs are minimal. Today they have begun another week long section of the AT minutes ago at Gifford Woods. In nine days their shuttle will pick them up further north in Vermont. Their packs are stunningly big and heavy at 65 pounds. Notso estimates 10-15 pounds are water and will be gone by day’s end. All told they have completed 1700 miles of the 2179 miles of the AT over 29 years. They ask about our trail names. I mention mine is Shootin’ because I like to stop and Shoot the Breeze with fellow hikers. Hannah explains her trail name of 2- Ply. As we were about to leave for home after a lovely weekend of hiking and spending time with dear friends, I ran up to the bathroom for one last visit. Just for fun, I came back down with a strip of toilet paper hanging out of the back of my waistband. George, in an effort to “save” me, sidled up to me and tried to remove the strip so others wouldn’t see (there were others in the room whom we didn’t know all that well.) In short order, I let it be known that I had, on purpose, left the strip hanging… Just for fun. I guess my performance that morning “earned” me my trail name: 2-ply!! Though we’ve been on the trail for three hours, we are more energized now because of our interactions with Fullspeed and Notso. I don’t envy their evening accommodations in a tent or a shelter. For us, it’s off to the North Star Lodge for a nap and then a glass of wine to toast our forty-one years together. PS For your viewing pleasure here is a 17 second video with Hannah at the Thundering Falls filled with irony. 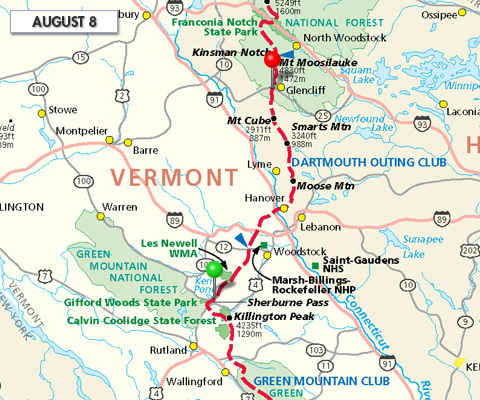 This entry was posted in Appalachian Trail, Appalachian Trail - 14 Day Hikes, Hiking, Vermont and tagged Appalachian Trail in VT, Appalachian Trail Names, Giffords Woods, Inn at Long Trail, Kent Pond, Killington, Thundering Falls. Bookmark the permalink. I never did understand the sock thing. How do 3 pairs of socks fit in your boots…along with your feet? Different boots for different sock days? Or perhaps the boots have stretched out with all that hiking? At any rate, keep it up!